This is an earwig. They are around one inch long. They could be black or brown and some may have wings. 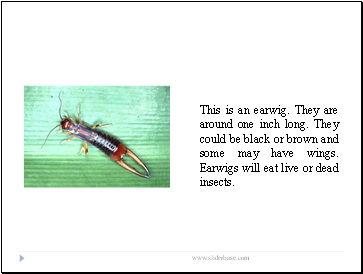 Earwigs will eat live or dead insects. 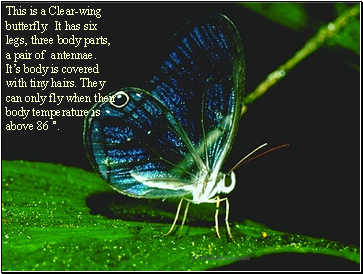 This is a Clear-wing butterfly. It has six legs, three body parts, a pair of antennae. It’s body is covered with tiny hairs. They can only fly when their body temperature is above 86 °. This is an ant. Ants have been on Earth for more than 100 million years. They can be found almost anywhere. 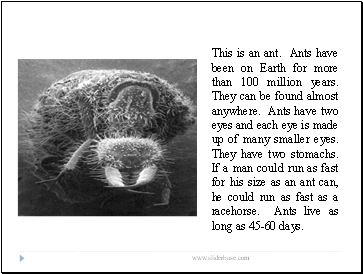 Ants have two eyes and each eye is made up of many smaller eyes. They have two stomachs. If a man could run as fast for his size as an ant can, he could run as fast as a racehorse. Ants live as long as 45-60 days. This is a house fly. The house fly can taste with its feet and with its mouth parts. They can’t bite. They can only eat liquids. They can liquefy many solid foods with their saliva. 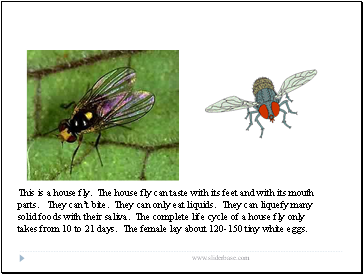 The complete life cycle of a house fly only takes from 10 to 21 days. The female lay about 120-150 tiny white eggs. This is a grasshopper. There are about 10,000 different kinds of grasshoppers. Grasshoppers have three body parts. They also have six jointed legs, two pairs of wings, and two antennae. Their body is covered with a hard exoskeleton. The biggest ones are about 4.5 inches. 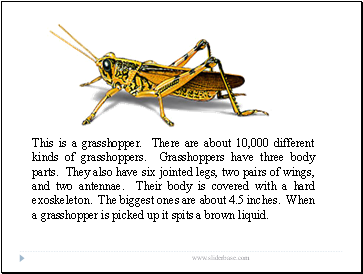 When a grasshopper is picked up it spits a brown liquid. This is a June beetle. 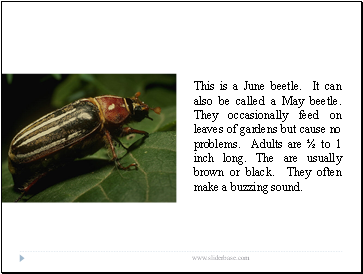 It can also be called a May beetle. They occasionally feed on leaves of gardens but cause no problems. Adults are ½ to 1 inch long. The are usually brown or black. They often make a buzzing sound. This is a firefly. There over 2,000 types of them. They can be 1/5 of an inch to one inch. Mostly all of the fireflies found in the United States are about an inch or less. 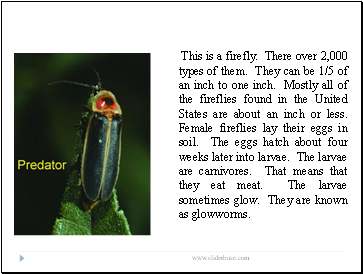 Female fireflies lay their eggs in soil. The eggs hatch about four weeks later into larvae. The larvae are carnivores. That means that they eat meat. The larvae sometimes glow. They are known as glowworms.